Imagine a home filled with three rowdy, laughing boys and one daughter with a giggle high and light. Now imagine a young, often tired mama, who tends to be on the serious side. She appreciates controlled fun, if there is such a thing. Imagine that tired, young mama opening her mind and heart to a world of fun and let’s pretend. Those rowdy boys and silly daughter teach her to play. They teach her to take life less seriously. Imagine life without my children? Impossible! What do your children teach you? Share with us in the comments. Recent conversations on Facebook and other media outlets have opened my eyes to a developing trend in Christianity today. Being a Bible-believing, truth-defending, Christ-follower is no longer popular even in many Christian circles! While criticism from the world is to be expected, criticism from fellow believers often surprises us! We are not accustomed to being labeled (or dare I say “judged”?) by those who should be our support. How warped is it that Satan has convinced some of us that simply standing on God’s Truth is being judgmental, and is therefore wrong? Allow me to clarify: the Bible DOES speak strongly against judging others and becoming self-righteous. 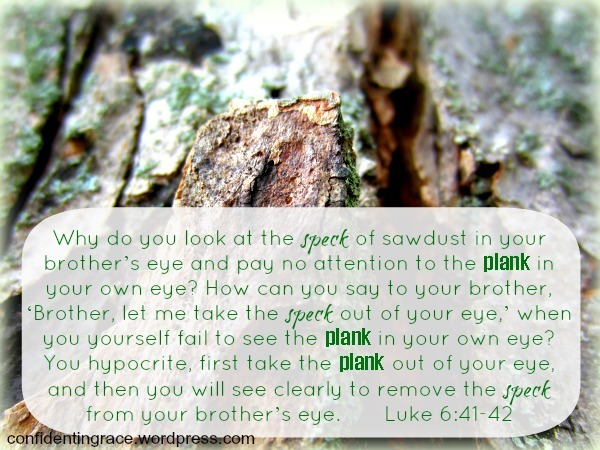 We are all familiar with the words of Luke 6:41-42. Only God can see, and therefore judge, the motives of the heart. Therefore, we should not pre-occupy ourselves with the sin of others; rather we should be too busy dealing with our own sin. However, God also calls us to be transformed by the renewing of our minds and to be bold in our witness as transformers. 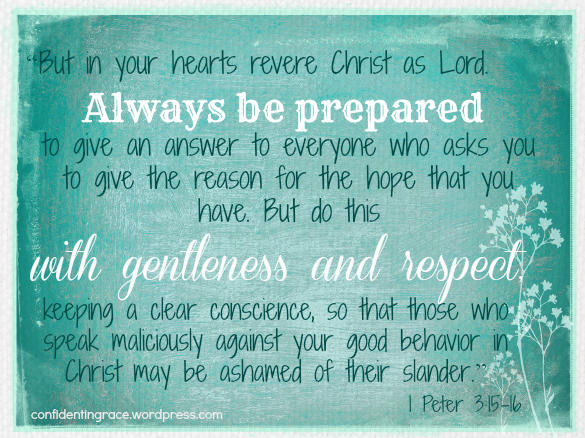 Unfortunately, well-publicized, so-called “Christians” have recently taken a stand for their so-called “truth” in ways that ARE harsh and hateful, tarnishing our witness. Furthermore, we have Christian brothers and sisters actively ridiculing others on forums such as Twitter and Facebook, adding to the world’s negative perception of us Christ-followers. While I fully support upholding God’s Truth, when we haughtily shove our beliefs in someone’s face with a sarcastic turn of phrase, a witty cartoon, or a picture that belittles others, we end up conforming to the world and looking just like it! How can we then be salt or light to a world that is in dire need of God’s truth? 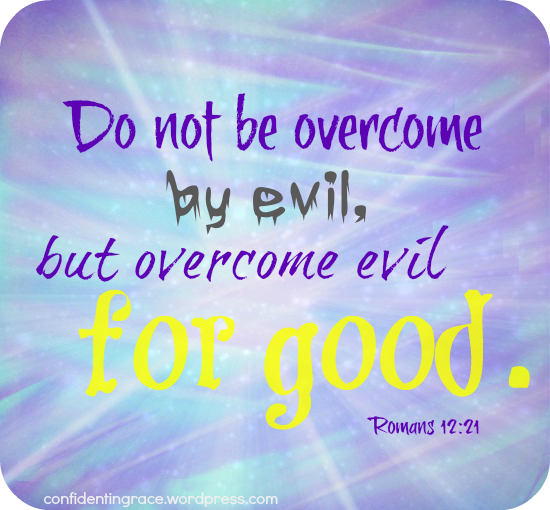 I believe Satan has seized hold of this shame over others’ behavior and used it to confuse believers (as well as the world!) and convince many of us that upholding God’s truth is wrong in and of itself, when the reality is that the fault lies in the method of delivery. We have only to study Christ’s example to see how he gently revealed truth to people, often with a single phrase or sentence, and always while caring for their needs, whether physical or spiritual. He did not skirt sin issues, neither did he humiliate the lost. We must follow Christ’s example in our efforts to live as transformers. When the Bible speaks clearly on issues of right and wrong, we are called to uphold God’s Truth with – and this is the key – LOVE and RESPECT. My purpose is this: consider carefully how your life and your actions or statements appear to others (especially in regards to social media). Do they see a difference? 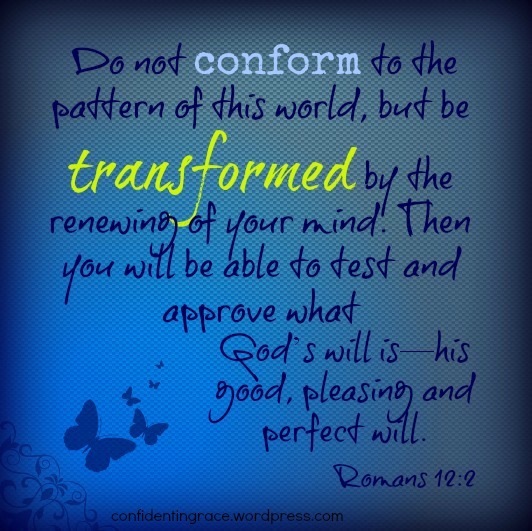 Are you being transformed by Christ, or are you choosing to conform to the world? There is no middle ground! If at the moment you find that you’ve been conforming (and haven’t we ALL at some point or another?? 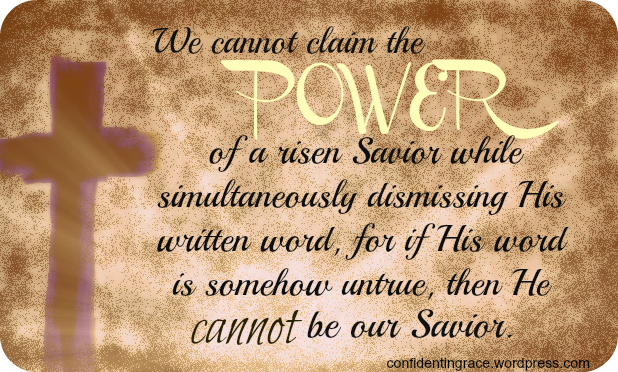 ), remember that God’s grace is immediate and His power to provoke change in us is immeasurable. On the other hand, if you are already actively trying to live out a transformed life, take heart. You are not alone! I encourage you to look to God’s Word and the Word alone to form your opinions, and allow the Holy Spirit to transform your thinking. Is your audience one you love and one who loves you in return? In other words, will your message be received in the manner in which it was intended? Is your message one of God’s truth rather than man’s truth? In other words, do you have contextual biblical support for your message? Have you achieved a balance between truth and grace? In other words, how is your method of delivery – gentle or smug? Telling the truth in grace and love is such a delicate balance to achieve, but as Christ’s image-bearers, we must work toward that balance! We have amazing technology and a unique opportunity to show the world what Christ-like love truly is, so let’s allow Christ’s love to shine through us without diminishing the light of His message. Don’t conform. Be a transformer. 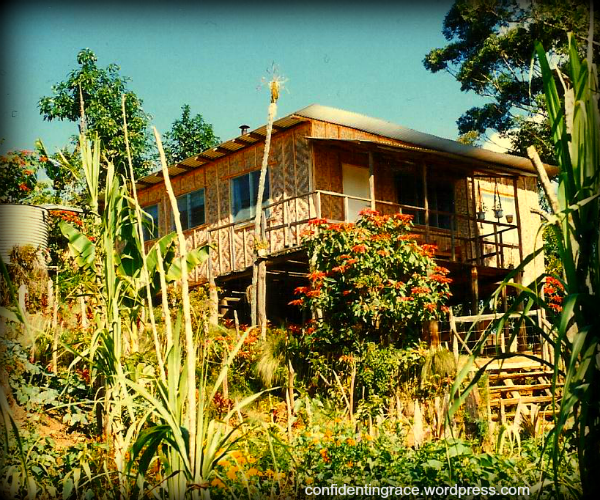 Last summer we sold our home and moved to the community that we are currently ministering to. 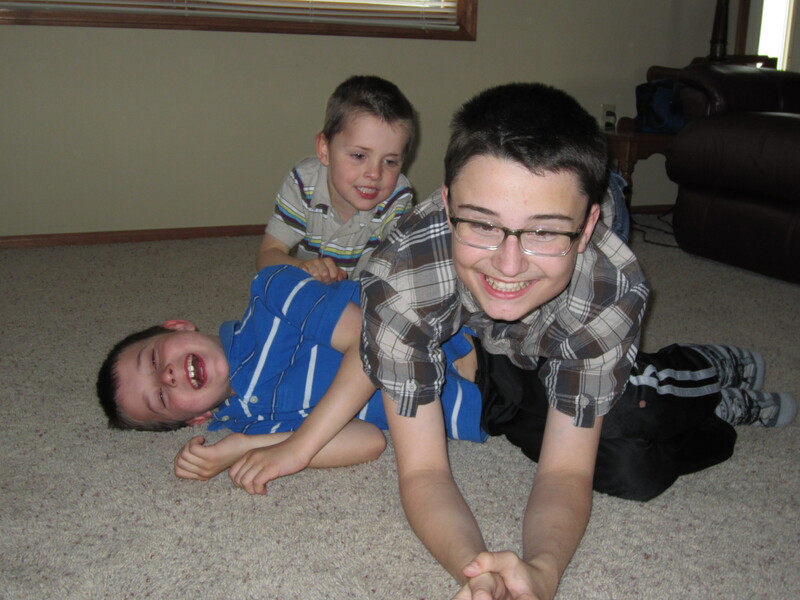 We were very blessed to be able to move into a larger home, and I just knew it would be perfect for the kids and perfect for entertaining people. 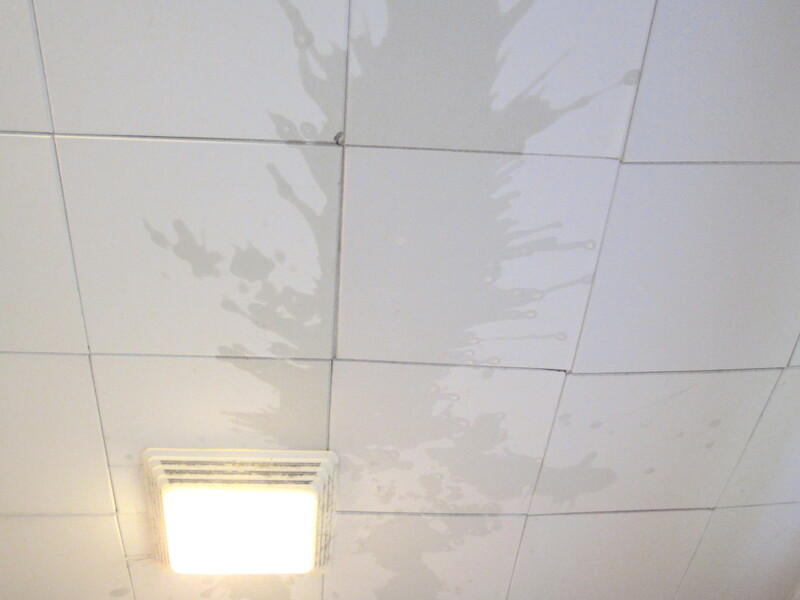 What I didn’t count on was the time it would take to adjust to cleaning and maintaining a larger home! I quickly found myself overwhelmed by the cleaning projects that come with maintaining an older, farm-style home. I struggled for months with the housework and felt like I was always “behind.” Because I felt frustrated and overwhelmed, every little mess the kids made irritated me – every spilled cup, every toy left out, every article of dirty clothing on the floor – and I often found myself grumping at them even as I was telling myself to have patience. I felt like I was losing my mind! It was as if I was stuck in Romans 7, knowing what I wanted to do, but feeling utterly incapable of doing it. So, after many tears of frustration and quite a bit of prayer, my husband and I decided it was high time to expect a little more of our four children. You see, our children have always had chores, but in the craziness of moving and settling in, we’d become lax in our supervision of them. We decided that the best way to save my sanity was to create new chore charts! I set about researching some age appropriate chores since we have such a wide age-span in our family and quickly realized that we had failed to see how much our children had grown. Obviously they had grown physically, but we failed to notice they were now also more mature and more capable of handling more difficult tasks. 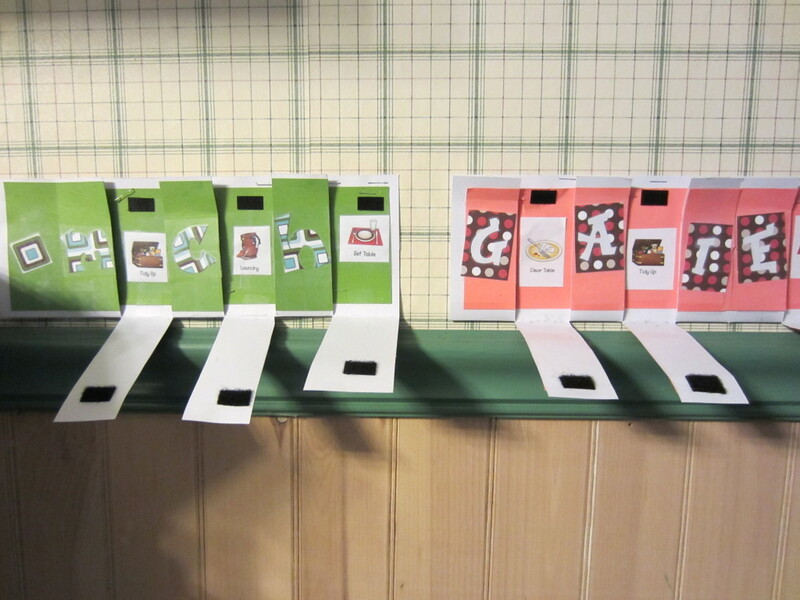 For our younger two children, we chose this flip-up system with pictures of each daily chore. When all chores are finished and flipped, they can see their names spelled out. Preschool chores focus mainly on taking care of the body, and beginning to take responsibility for their own messes. We chose to incorporate things that should become daily habits such as: brushing teeth, making bed, getting dressed, clearing dishes from the table, picking up laundry, and picking up toys. They both remain very enthusiastic about flipping up the chores they have done each day, even after several months have passed! Our older boys have more complex chore charts that are laminated so they can be re-used. We use dry-erase markers to check things off. One of the things I like most about the chore charts for the older boys is that they are divided into categories that emphasize different areas of their personal responsibilities. You can see the various categories highlighted on the left in the picture below. The weekly responsibilities have options to allow for personal choice, and the tasks in that area of the chart are more difficult for our oldest son, who is 13. In our home, chores are part of being a family and working together toward a common goal, which is to be good stewards of the material things God has given us. Doing chores helps our children to learn personal responsibility as well as team-work. For that reason, we do not pay our children an allowance in relation to their chores. Instead, we reserve allowance for teaching financial stewardship and how money works in general, but that is just our family preference. 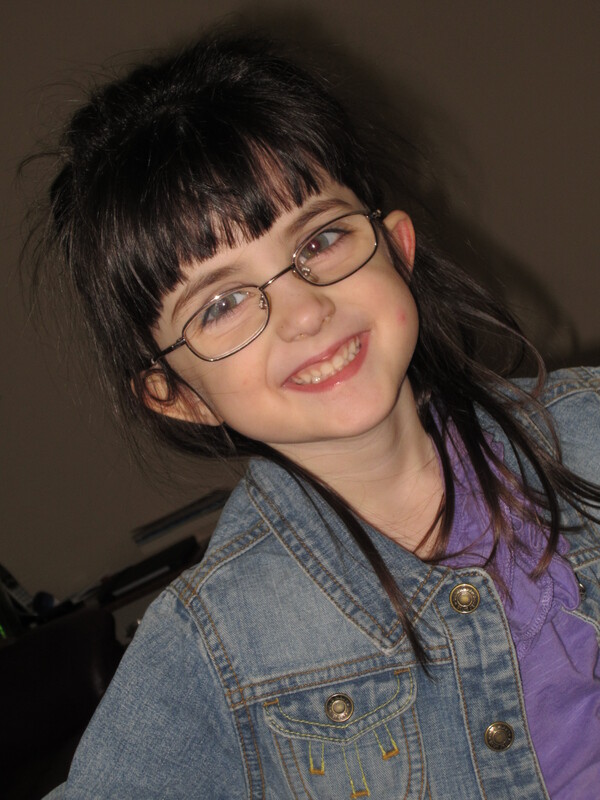 In an attempt to lighten the mood and help them adjust to additional responsibilities, we added a bonus for good attitudes and for helpfulness without prompting – an additional 50 cents on their allowance. For our new chore system to function well, we realized that we would need a consequence for those times when our older boys failed to complete their chores. We wanted the consequence to be more of a learning opportunity (“the punishment fits the crime” approach). Eventually we settled on this method: if there is a pattern of a chore going undone, then the consequence would be to complete the undone chore, as well as an additional one. I love this solution! It simultaneously helps me and provides an unpleasant experience that they don’t wish to repeat. I’m happy to report that we rarely have to enforce consequences with the chores because the boys really, really dislike doing extra chores. Although we’ve had a few bumps along the way, our house has been much tidier in general, considering we have four children living here. I no longer feel overwhelmed on a daily basis. Additionally, I’m less uptight about the messes the little ones make because I know they’ll be picking them up before bed. My sanity has been restored! Perhaps most importantly, I know that developing these good habits now will benefit them greatly as they grow into adulthood. Although initially the chore charts mean a little more work for us parents in supervising and making sure tasks are completed (or even teaching a new skill), the goal is to eventually make parenting a little easier in this area of keeping a tidy home. So, if you’ve been feeling overwhelmed by your housework, feeling taken for granted as the one who cleans up after everyone, or feeling like you just might lose your mind, consider the following questions. 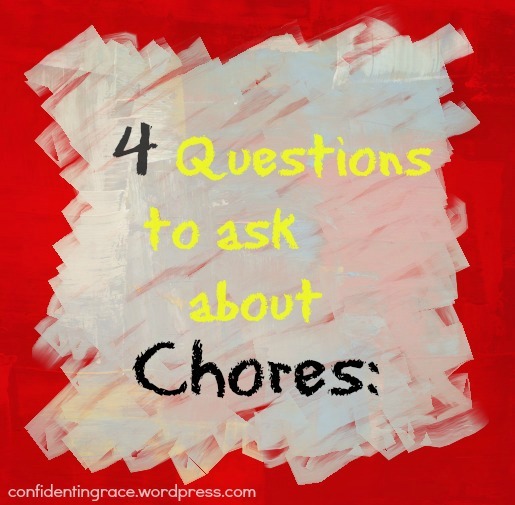 Are the chores age-appropriate? If like me, you failed to realize how “big” your babies are getting, you might want to rethink your expectations of them. 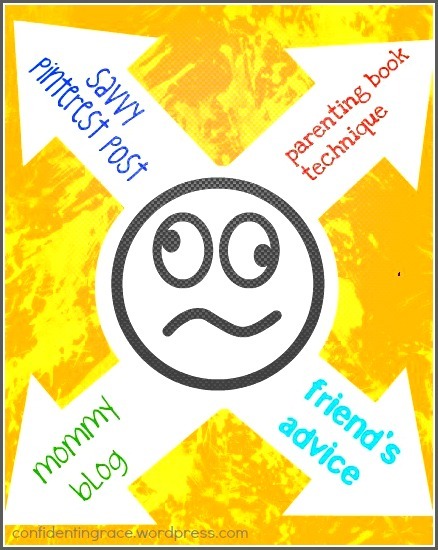 If you are unsure of what chores are appropriate for your children, a quick google search or pinterest search will return a wealth of information! Are the chores focused on teaching your children personal responsibility? 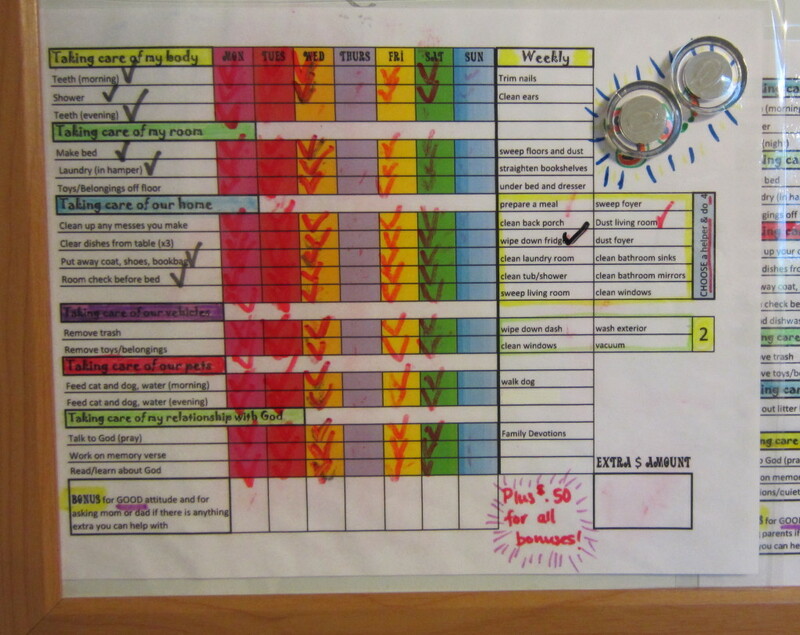 One of our goals with the new chore charts was to emphasize the stewardship aspect of chores. We want our children to learn to take care of their things and the things we share commonly, such as our home and vehicles. For now I am very happy (and sane!) with our current chore charts, but I’m sure after a time we’ll need to look at it again and make changes. I wouldn’t mind trying out a few different methods to give the children a variety, to keep it fresh and exciting. If you don’t currently have a chore system in place, why not give one a try? It just might save your sanity! What methods do you use for teaching responsibility and team-work in the home? Give us your best advice in the comments! I love music. I love to sing it, I love to play it (when I have time), and I love to listen to it. I love all sorts of music, too. In our house you might hear contemporary christian, classical, broadway, oldies, big band, some jazz, a little country, a little rap. and even some of what my husband refers to as “love music” (think ballads!). By far my favorite music is the kind that speaks truth directly to my soul! You know what I’m talking about – those songs that are almost devastating in their truth and beauty. Even my young, four-year-old daughter knows the power of music. I can no longer sing, “Rock-a-bye baby” to her because the melody makes her sad. On the other hand, my seven-year-old son likes enthusiastic jams from artists like TobyMac, not surprising since he’s our energetic one. When the kids are fighting with each other and just can’t seem to get along, a dance party to some great music goes a long way toward re-establishing their sibling camaraderie. When nothing seems to be going right, I find solace in music. Psalms 95:1 – O come, let us sing unto the LORD: let us make a joyful noise to the rock of our salvation. 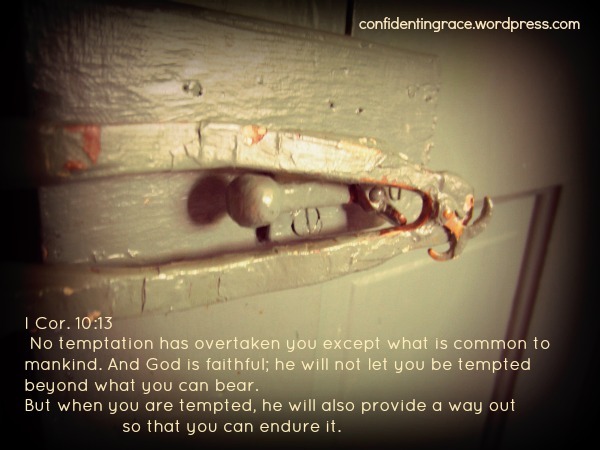 James 5:13 – Is any among you afflicted? let him pray. Is any merry? let him sing psalms. In the scriptures we read about times of rejoicing, accompanied by music, and times of sorrow, accompanied by music. When David killed the Philistine giant, God’s people rejoiced through music. When King Saul struggled with sorrow and other emotions, David’s instrument soothed him. When Paul and Silas sat imprisoned, they sang songs of thankfulness and praise to the Lord. Music is for happy times, sad times, and all of those times in between. Praise the Lord for the incredible gift of music! So today when my head and heart are full of so many different thoughts and emotions that I don’t even know where to begin, why not begin and end with a song? When do you turn to music? I have a soft spot for those who struggle with chronic health issues, those who experience chronic suffering. Just recently, I had yet another bout with sinusitis and was reminded once again how much I dislike being ill. I have a medical history complicated by allergies and asthma along with an immune system that just doesn’t work well and never has. While my medical issues pale in comparison to so many others, I struggle often enough to understand some of what it feels like to battle chronic medical conditions. I understand that chronic sufferers often feel lonely because illness keeps them at home in isolation. I understand the judgment sometimes felt from uncaring medical professionals, unsympathetic friends, and even gossipers who relate physical health to spiritual health. I understand the weariness of facing yet another day of pain with no end in sight. They’re just depressed. They need to get help. They obviously can’t handle pain well, so they exaggerate their symptoms. All they do is complain! They are not living a healthy lifestyle. If they would just eat right, exercise, etc. then they would feel better. They are not disciplined enough. They should just do what’s right in spite of how they feel. They’re not trusting God enough. While all of these statements have the potential to be at least partially true in many cases, they come across as self-righteous. Is that a little harsh? However, such self-righteous thoughts or even voiced opinions do nothing to uplift or encourage that sister in Christ who is so lonely, so overwhelmed, so discouraged, so needy. Consider these excerpts from Job, who suffered for the glory of the Lord. 3 Will your long-winded speeches never end? Job was “blameless and upright”; he had done nothing to deserve his suffering, and he continued to turn to the Lord throughout. Yet, how did his religious friends respond? They criticized him. They questioned his faith. When he needed them most, Job’s friends failed him. How sad that they missed the opportunity to demonstrate brotherly love to Job! As sisters in Christ, we are called to minister to those in need! Even if those suffering are not as blameless as Job, we are responsible to love them through the difficult times. I know from experience that suffering from a medical condition can make a person pretty needy, and sometimes we grow weary of giving to someone who cannot give back. Trust me; I’ve been on that side of the coin, too. How quickly we forget the depth of the dark when we are bathing in the light. So, how can we avoid being unsympathetic know-it-alls like Job’s friends? 2. Remember that dealing with medical issues can be scary and lonely, especially when an issue lacks a confirmed diagnosis. Doctors are not always correct and sometimes they lack the medical knowledge or the compassion to find answers patients need. Just because a person does not yet have a diagnosis does not mean “it’s all in the head.” Remind them that you will remain a faithful friend. 3. Before you offer advice to your suffering sister, consider your relationship with her. Are you close enough to her to have all of the facts, or have you made assumptions based on partial information? Have you first spent time in earnest prayer for her? Do you have a strong enough relationship that she will be able to hear you in love without being wounded by your words? We don’t always understand His ways, His reasons, for allowing trials in our lives, but we can trust in His compassion for us. Jesus suffered. He suffered physically, emotionally, even mentally in his life as a human on earth. He was betrayed by friends and rejected (albeit briefly) by His own father. He suffered horribly and then He died. If anyone can understand your pain, He can! 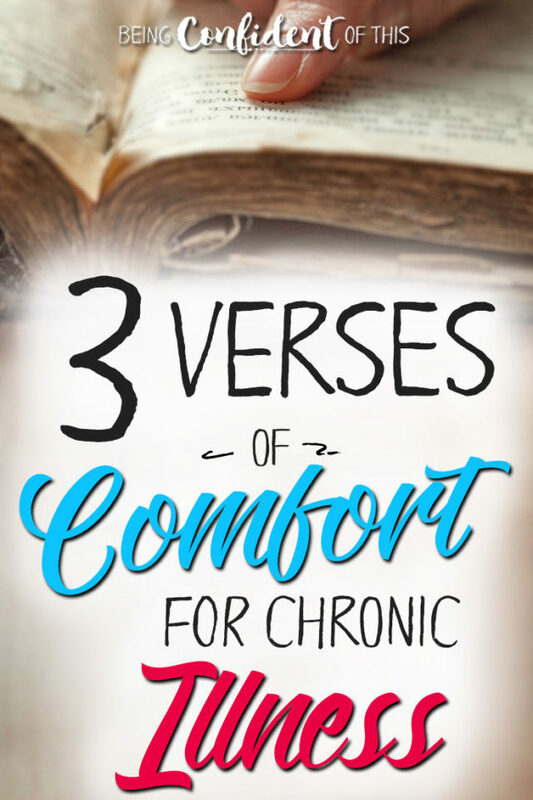 Over the years, I have learned that God often uses illness to get my attention, to bring me back to that place where I am totally reliant on Him because my physical body has failed me. I don’t always know or understand why God allows such frequent illness, but I am secure in the fact that He only allows things into my life that He can work for good (Rom. 8:28). I hope you find that same comfort! So as we go about our week, let’s remember those in our circles who are hurting. 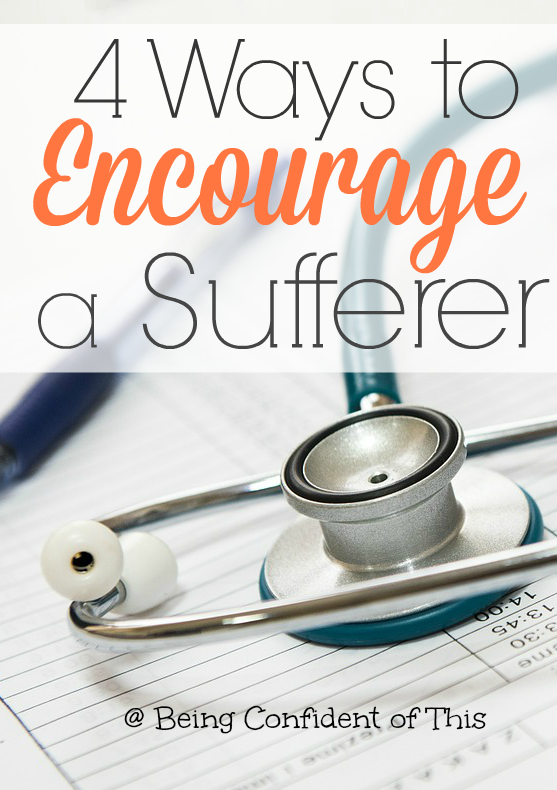 I challenge you to put a little time and effort into encouraging a suffering sister in Christ this week! Immediately my eyes burned with tears because I knew that feeling, the feeling of not being good enough, and I certainly did not want my child to ever fear that he wasn’t “good enough” for me! Nevertheless, somehow I sent that message to him, and although unintentional on my part, I felt overwhelmed by sadness and then by conviction. You see, God’s been speaking to me about this issue lately, about my tendency toward perfectionism. I’m realizing it’s not only frustrating for me, but it’s something that often negatively effects my relationships with others also. For these reasons, perfectionism is the personality trait that I dislike most about myself. 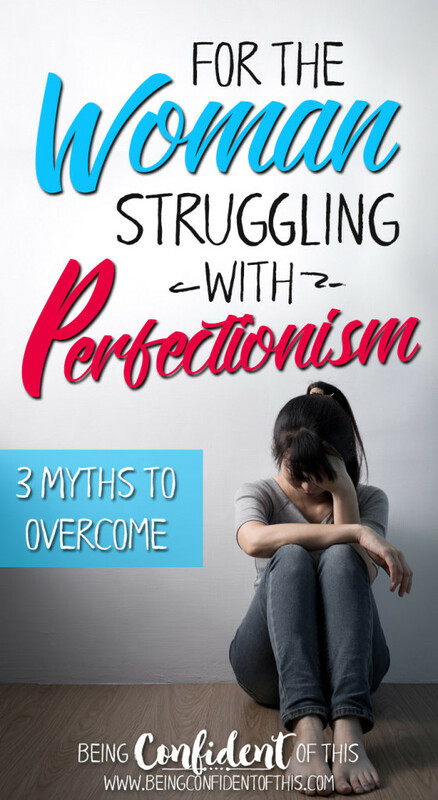 So why do so many of us women struggle with perfectionism and other personality flaws? Because we have bought into the Superwoman Myth. You know, the myth about the woman who does it all and does it perfectly?! Wouldn’t we all love to be that supreme woman, to bask in the knowledge that we ROCK at being women – everyday in every thing and all of the time?! If Superwoman truly exists, she certainly is difficult to find in the midst of our messy everyday lives. 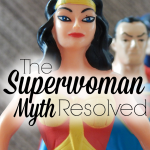 The first contributor to this Superwoman Myth is self. How many times have you written yourself a to-do list a mile long and actually expected to get most of those tasks accomplished? And at the end of the day when you have only made it to number 3, how do you feel? Or consider this: How often do you feel like you’re making so much progress in one area, only to discover you’re completely falling apart in another? Although some of us may come close to being Superwoman on a given day, soaring above the circumstances of messy homes, sick family members, extra hours of work, and so forth, the perfect mother, the perfect wife, sister, friend, daughter, child of God – she does not exist! Instead of listening to the lies perpetuated by our superwoman-wannabe selves, let’s listen to the truths our Creator God has to say about us. God created you purposefully and intentionally to be who you are. While he did not create you to sin, He did create you with your unique personality, your unique strengths and weaknesses. The good news is that even those things we tend to see as our weaknesses can become strengths with His help. Those personality traits we so often view as flaws have positive aspects to them, my sisters in Christ! For example, while my perfectionism easily leads to worry and sin, it is incredibly helpful for tasks that require attention to detail. Likewise, people who are argumentative may be difficult to get along with, yet they make excellent lawyers and advocates for others. While those who are easy-going often lack organizational skills, they are typically great friends and listeners. Let’s find the beauty in being who God created us to be instead of wishing we were someone else. Let’s allow Him to work in our weaknesses to make us strong. 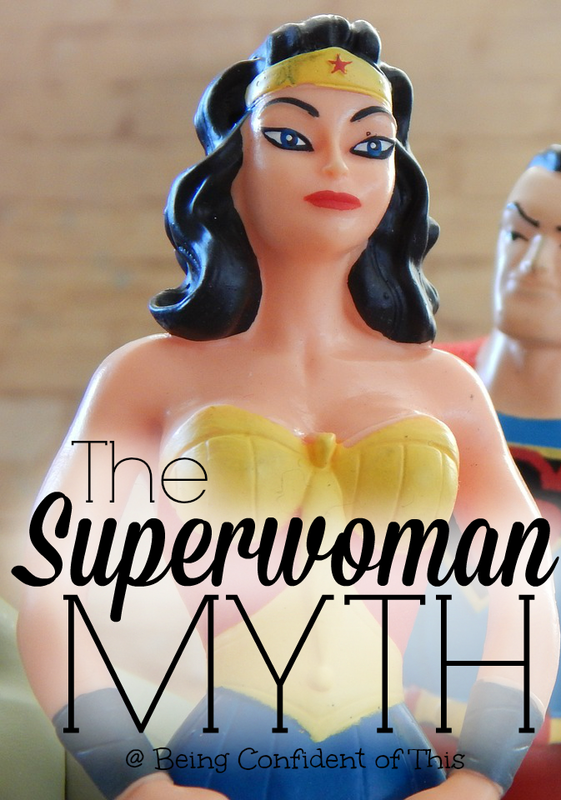 The second contributor to the Superwoman Myth is how we view others. How many of us can honestly say that we’ve never compared ourselves to another woman…ever?! Especially in this age of social media, we are very aware of the skills other women have. Furthermore, we often envy those things in others that we feel we are lacking. Don’t get me wrong, it’s great to admire others and to challenge ourselves to grow. that we can possibly be. The problem is that sometimes when we see all of this womanly awesomeness out there, we wish that we could be someone we are not, someone we were never created to be. – you fill in the blank! 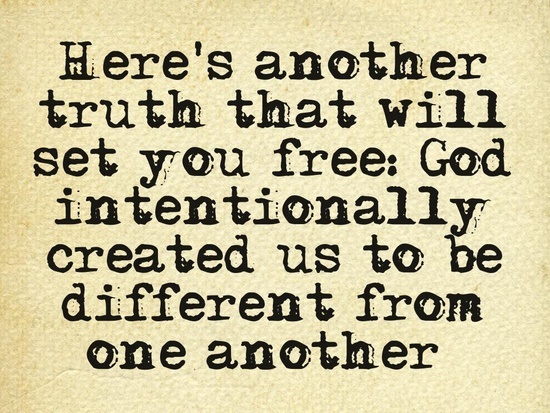 But the beauty of a relationship with God is that it’s personal, unique to the individual. While all women are similar in that we are imperfect sinners, saved only by the belief that Christ’s shed blood paid the penalty of death we so deserved, we can be very different in the way we live our faith out. We each have a part to play in the body of Christ, and He’s created each of us uniquely to fulfill the role He’s planned out for us. So the next time you feel unworthy, inadequate, or that you just don’t have anything “special” to offer, remember that God created you to be you, and that He created you to fulfill your role and yours alone. No, He simply wants me to be the best Jen. And the best Jen might look very different from the best Kelly or the best Martha. Now, isn’t that truth freeing? 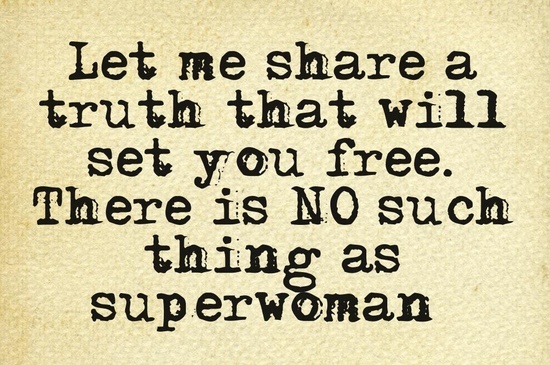 Follow me to part two of the Superwoman Myth to discover the third and final freeing truth and to learn what to do with that least favorite personality trait of yours. There is no peace, no quiet. 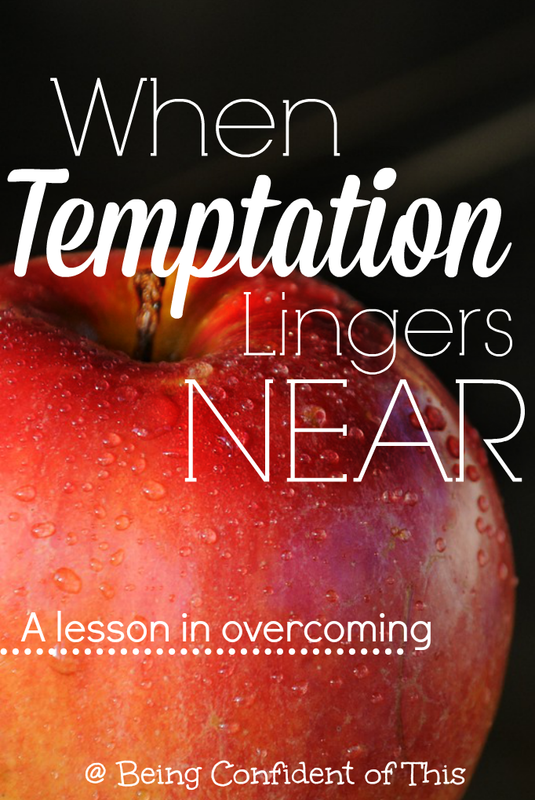 But I need to pray because I am one moment away from falling into temptation. One moment from allowing my impatience, anger, resentment, and frustration to spill over onto my family. One moment away from blowing any chance at doing right. Like many women, I’ve been really busy this week with a lot of good things. In addition to my everyday tasks, two things in particular have taken up a fair amount of time: a Mother’s Day talk I am working on for church and a future blog post that just isn’t quite right yet. They are both really good things, both uplifting to the Body of Christ and instructive for me, the writer. However, last night and this morning God was working in my heart to show me a truth that I had learned before, but temporarily forgotten. Good things can become bad things when they distract me from the BEST thing – my relationship with Him! You see, I thought I was doing good by feverishly working on these projects in my spare time, which you can understand as a mother of four children is indeed very spare. In my zeal and enthusiasm for this good work, I forgot to turn to the Source from whom the words flow. I neglected the best work! Sounds an awful lot like Martha, doesn’t it? Martha was busy doing good things – taking care of others, preparing food to serve them, and so forth. They were necessary preparations. But when she expressed her frustration to the Lord about her sister Mary, He actually rebuked her instead! He told her that Mary’s choice to fellowship with and learn from Him was the better choice, the BEST choice. 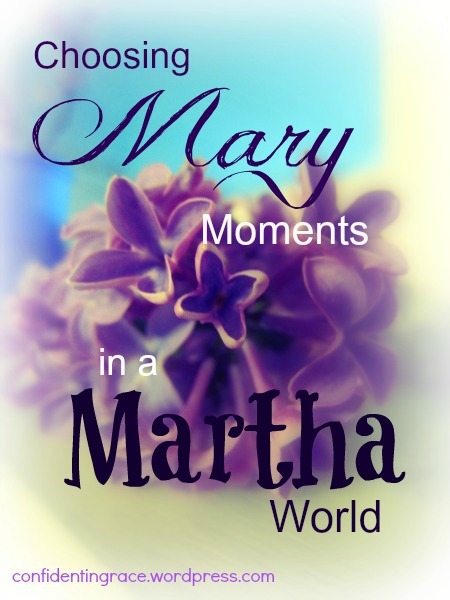 Jesus audaciously suggests that perhaps Martha should be choosing some Mary moments! I had the opportunity earlier this year to attend a women’s conference, and the main speaker, Kimberly Sowell, so aptly narrated this story to us. 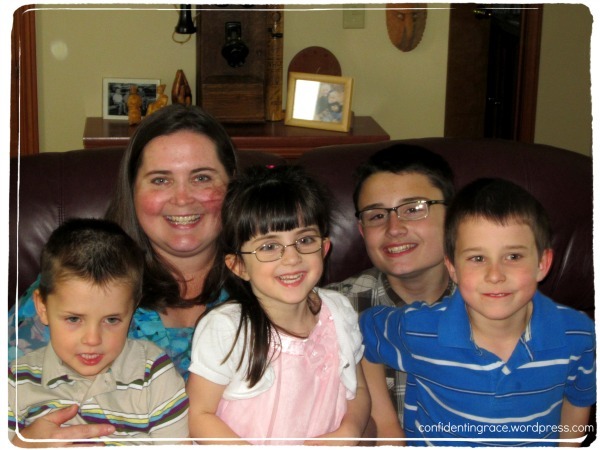 She reminded us that we live in a Martha World – full of work and busy schedules. Those tasks, those good and necessary things that we do on a daily basis (raising up children, working, serving others, preparing meals, even work related to ministry) have to be done, but we must be careful not to let them distract us from the most important thing – abiding in Him. Don’t make the mistake I made; don’t choose simply good things over the BEST thing. Choose to make time for a Mary moment in spite of your Martha world. And as soon as you start choosing Mary moments, don’t be surprised if something needs your immediate attention. This morning, as soon as I sat down on my bed and opened my Bible, my preschoolers who were playing so nicely together suddenly needed my TOTAL attention. Thankfully, God reminded me that Satan is always at work, and rather than getting frustrated and giving up, I was able to quickly attend to their needs and come right back to my Bible. It wasn’t easy with two distracting 4-year-olds at my feet (and on my bed, sometimes even in my lap), but it was worthwhile, and I know He was pleased with my obedience. I know because when I finished, I had peace. Will you be choosing Mary moments today? 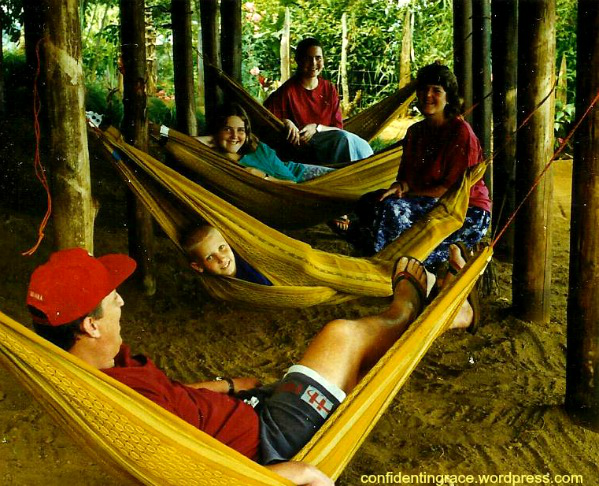 For practical advice on how to focus on the Best thing, read more here. *After writing this, several readers mentioned this book. I haven’t read it yet, but it looks excellent!